A new study by the Cologne based Institute for Economic Policy (Institut für Handelsforschung – IFH) asked pedestrians about the amenity of their city’s centre. The highest ranking was given for the city Leipzig in Saxony, which also gave the city the lead for the large cities above 500.000 inhabitants. Decisive for a citie’s attractiveness (according to the study) are factors like ambience, flair and character of its buildings. Only second in importance is the diversity of shops. Being specialists for visualizing the architecture of city centres and its streetviews we will give an overview on the rather compact city centre in Leipzig. The central block in this Reichsstraße panorama is also crossed by passage ways in all four directions, its left half is the so called Speck’s Hof. It stretches all over the block up to the other side and in 1996 its reconstruction earned it an international prize for best restauration. On the left we see the solitary Riquet building, its name going back to an old merchants family. The eye-catchingly decorated building with two large elephant heads above its entrance houses one of the most frequented traditional cafés of the city today. Indeed the street block ends right next to the building, still testifying the bombings of 1943 which destroyed large areas of the city centre. Around the next corner we are inside the Salzgäßchen, which leads back to the market square (right). On the left we see the Handelshof (also a former trade fair palace), housing the Steigenberger Grandhotel today, then the backside of the Alte Börse (old stock exchange) and a side of Leipzigs old city hall. Leading south from the square, Petersstrasse is one of Leipzigs main shopping streets. In fact, back in 2003 this streetview inspired the whole idea for PanoramaStreetline. In general Leipzig is regarded a city with a comparably intact historic centre today, despite of bombing losses. One reason is that the city only appears historical in a way. Indeed most buildings are not older than 150 years and were errected during the city’s groth period in the late 19th century and when all the trade fair palaces replaced older structures – which also means they had modern techniques like fire safety walls. This in turn prevented a large scale-fire all over the area which resulted in more historic substance surviving within the centre, despite Leipzig being one of the ten most bombed german cities. There was a rare view towards the street front of the Brühl with its splendid Romanus-Haus (left), a rare example of the Leipzig Baroque style. Further left we see the Leipzig Bildermuseum (Museum of Fine Arts), which is now hidden by another block of buildings surrounding it. The Brühl street, which derives its name from the swampy meadows once lying north of the medieval centre, once was one of the important trading routes in Leipzig and had its own place in history as the world’s leading street in fur trade. And here is another view from the same viewpoint, now towards the north across the Leipzig city circle. On the right we see the evangelic reformed church, then the high class Fürstenhof hotel and the Ring-Messehaus, an eight-storey building covering large areas in the back – once the largest inner city trade fair building in the world. Currently its being turned into a new hotel. Now interested in a more detailed walk around Leipzigs centre? 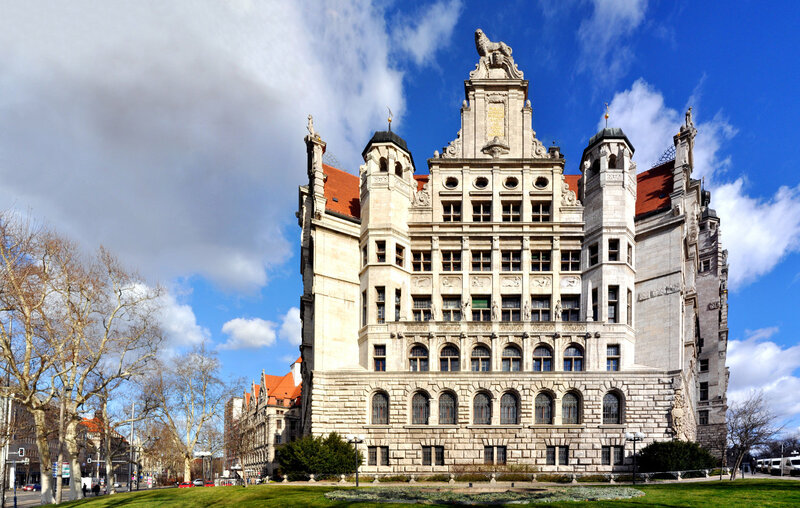 Be inspired by our Three hours in Leipzig walk. Here we’ll finnish with some views around the Leipziger Ring (the inner city circle). But before that a few more words about the aforementioned study on attractiveness. Indeed, Leipzigs centre is a splendid one, thanks to centuries of trade fair and commercial traditions, thanks to its self confident citizens and maybe even a tiny bit thanks to infamous building tycoon Jürgen Schneider. But how significant is the title most attractive centre of germany? Well there is a bit of regional bias as the pedestrians only rated the local city. Furthermore not all cities were compared. Out of all the fourteen cities with 500.000+ inhabitants six were missing (Stuttgart, Munich, Frankfurt, Dortmund, Essen and Dresden), so Leipzig was only compared with Düsseldorf, Hamburg, Bremen, Berlin, Hanover, Cologne and Nuremberg. For smaller cities even more of them were missing in the comparison. However the winners of the other size categories are Erfurt, Heidelberg, Hilden (second place), Wismar and Quedlinburg. Here we go on with a view towards the westside of Augustusplatz, lying next to the Leipziger Ring. On the left we see the university complex with its former high-rise, on the right we see the Kroch-Hochhaus, the cities first high rise from the 1920s. Further to the southwest we turn into Schillerstraße, where we can find several former bank buildings from the times when Leipzig was the banking city of Saxony. And finally we have two street block along Dittrichring. Here representative historicistic buildings were errected after the fortifications were torn down in the 19th century and the city opened up towards the promenading ring around it. Finally interested to get into Leipzigs underground? Here is a complete view of the City-Tunnel station Wilhelm Leuschner Platz. The City Tunnel crosses the centre from north to south since 2013, connecting the main station with the Bayerische Bahnhof (Bavarian Station). More streetline views from all over Leipzig.